In this matter, we will refer to the great modern doctor of the spiritual life, Fr. Reginald Garrigou-Lagrange: “Spiritual direction should be numbered among the exterior means of sanctification. […] Though it is not an absolutely necessary means for the sanctification of, souls, direction is the normal means of spiritual progress. In constituting the Church, Christ willed that the faithful should be sanctified by submission to the pope and the bishops with respect to external jurisdiction, and in matters of conscience to confessors, who point out the means needed in order not to fall back into sin and to make progress in virtue. “Pope Leo XIII, (Testem benevolentiae, 22 January 1899) following Cassian and St. Francis de Sales, recalls on this subject the fact that St. Paul himself received a guide from the Lord. When Paul was converted, Jesus did not at once reveal His designs to him, but sent him to Ananias at Damascus to learn what he should do. “In his conferences, Cassian says that anyone who relies on his own judgment will never reach perfection and will not be able to avoid the snares of the devil. He concludes that the best means to triumph over the most dangerous temptations is to make them known to a wise counselor who has the grace of state to enlighten us. In reality, to manifest them to one who has a right to hear them often suffices to make them disappear. “St. Bernard says: ‘He who constitutes himself his own director, becomes the disciple of a fool.’ And he adds: ‘As far as I am concerned, I declare that it is easier and safer for me to command many others than myself alone.’ Our self-love leads us less astray, in truth, in conducting others than in dealing with ourselves, and if we knew well how to apply to ourselves what we tell others, we would make far greater progress. “We understand quite well that we need a guide if we intend to climb a mountain. He is not less necessary for climbing to the summit of spiritual perfection, the more so as in this ascent we must avoid the snares laid by Satan, who wishes to prevent us from ascending. Am I holy enough for spiritual direction? One of great problems in the modern approach to spiritual direction is that many Catholics think that they already need to be well along the path of holiness before they can profit from spiritual direction. How foolish this is! Who needs the guide more: The man who is well experienced or the one who is lost? Moreover, it was for the little ones and the lost sheep that Christ came – let them now come to him and find profit. What is most necessary for spiritual direction is not holiness itself, but the desire for holiness. Just as what is most necessary for anyone seeking a guide is not that he already know the way (nor less that he already have accomplished his goal), but simply that he desire to know the way and be resolute in striving for the goal. To climb the mountain we need only two things: The will to persevere and a good guide! 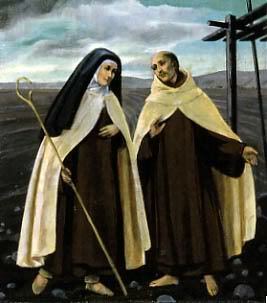 St. Teresa of Avila insists that spiritual direction is part of the ordinary life of the Christian – something to which nearly every person should avail themselves at some point during their journey. In particular, the Church herself encourages all those who strive for a special perfection in the spiritual life to entrust themselves to a director – all the faithful are required to receive some direction in the spiritual life through at least a yearly confession. We all need at least some level of spiritual direction – at the very least, we need the counsel of a confessor. Spiritual direction is an ordinary part of the Christian life, something to which we all should avail ourselves at least at some point of our spiritual journey. However, there are times and circumstances which demand a more intense and consistent program of direction – this is when one on one direction becomes truly necessary. There are several circumstances which require us to look for spiritual direction: If we are considering religious life or a vocation to the priesthood; if we are a priest or a religious; or if we are experiencing supernatural visions or locutions. There are certainly other cases as well, but these seem to be the most essential times for direction. However, we must also say that spiritual direction can be necessary in a secondary sense for those who are seeking to grow in holiness in a particular way, especially for those who are attempting to move into regular contemplative prayer. I say that spiritual direction is necessary for these persons “in a secondary sense”, meaning that it is not strictly and absolutely necessary (such that the goal cannot be reached without direction), but rather it is necessary in the sense that the goal cannot be attained in as fitting or perfect a manner without a director. Indeed, it seems that it would be better to have no formal direction at all than to have a bad spiritual director – just as it is better to wander alone with some limited sight than to be led by the blind. In this regard we point to our earlier article on this subject. “His charity ought to be disinterested and to incline him, not to draw hearts to himself but to lead them to God. The director's charitable kindness should not be weakness; it should be firm and fearless in speaking the truth in order to lead souls effectively to goodness. Neither should he lose his time in useless conversations or letters, but go straight to the point for the good of the soul. “In addition, he should have a knowledge of the spiritual life, be penetrated with the teachings of the great masters of the interior life, and be a good psychologist. “That the director may be the instrument of the Holy Ghost, he ought prudently to discern in souls the dominant defect to be avoided and the supernatural attraction to be followed. For this purpose, he must pray for light, especially in difficult cases, and, if he is humble, he will receive the graces of state. What if I cannot find a spiritual director? To answer this question, we refer our readers to an earlier article. I read your previous article on what to do if you can't find a suitable director and came away a little perplexed: why do you list only works by modern authors in your list of recommended spiritual reading? Your recommended authors span from the 16th to the 19th centuries. Why no works by the Fathers or the Medievals? Might the category of doctors of the spiritual life include only moderns because this is a particularly modern category? I ask this as an avid reader of the Fathers and Medievals, but as one not particularly familiar with the modern tradition of spirituality, a category I do not find in the Patristic or Medieval era. You are right to point out that I only recommended modern authors (i.e. 16th century forward). In truth, the greatest and most important works are certainly from the earlier periods (both ancient and medieval). The main reason that I recommended the more recent works is that they are generally more approachable for a modern audience. St. Alphonsus, in my own experience, is easier to read as a spiritual guide than St. Augustine (and his Confessions is one of the most overtly spiritual treatises from among the Fathers' writings). St. Athanasius' Life of St. Anthony. St. Augustine's Confessions, On Christian Doctrine, On the City of God, On the Sermon on the Mount, and his Commentary on John. Cassian's Conferences (which St. Thomas Aquinas never tired of re-reading). St. Gregory the Great's Commentary on Job. St. Basil's Rule, and On the Holy Spirit. St. Gregory of Nyssa's Life of Moses. St. Dionysius' On the Divine Names, On the Ecclesiastical Hierarchy, and On Mystical Theology. Richard of St. Victor, Hugh of St. Cher (De vita spirituali), St. Albert the Great, St. Thomas Aquinas (Commentaries on Job and on John and ST II-II, on the virtues and on grace), and St. Bonaventure. Certainly: St. Catherine of Siena, and others as well. The list could, of course go on and on. Athanasius' Life of St. Anthony, Augustine's Confessions, Cassian's Conferences, Benedict's Rule, and Gregory of Nyssa's Life of Moses (it seems to me) deserve special attention. An outstanding list, including some I need to read for the first time, and the rest of which I need to re-read! Thanks for the delightful reminder. n.b. I was not clear on the references to St. Thomas Aquinas' spiritual writings ... the whole ST II-II is worth reading, especially the part on the virtues. Additionally, the treatise on grace from the I-II is of great value. I would love to find a spiritual director, but I am more than a little gun shy of priests. What's worse, when it comes to "luck", I have none. Consequently, I would happen upon one probably who would do me more harm than good. Leave it to St. Bernard to tell it like it is: "He who constitutes himself his own director, becomes the disciple of a fool." Speaking for myself, that is quite an apt observation. In today's Church it is extremely difficult to find a spiritual director because to make the kind of judgement on a priest's prudence, learning, wisdom,etc. is difficult to ascertain unless one knows the priest personally. You can't just attend Mass and go to confession and ascertain this information. Plus this eliminates most young priests just because they do not have the learning or acquired wisdom to direct. You wouldn't trust a critical operation to a doctor who was just a few years out of med school, would you? Then thrown in the fact that most older priests are incredibly busy (as they are usually pastors) and you basically have mission impossible. It is easier to read spiritual classics like "The Mystical Evolution" by Father Juan Arintero. This is exactly where/what my current discernment prayers have been. My biggest fear maybe that I will not be able to/won't give the practice the time attention it needs to succeed. That's a spiritual weakness. perhaps what seems like a vicious circle is simply my lack of courage. More to pray about. Just as St Francis De Sales carried a book on his own person by Dom Lorenzo Scupoli called "The Spiritual Combat and a Treatise on Peace of Soul" for 18 years, read from it every day, and recommended it to everyone under his direction, there is also another simple and most excellent book that can be used for spiritual direction in the same way. It is by Fr Jacques Philippe, and is called "Searching for and Maintaining Peace - A Small Treatise on Peace of Heart". Books such as these have their greatest benefit if read slowly. A 3rd excellent book that can be used for Spiritual Direction is by St Francis De Sales himself called, "Introduction to the Devout Life". Most books of direction up until that time were mostly written for religious, but the holy bishop known for his gentleness wrote this one specifically for lay men and women. In it you can see how much he was influenced by Dom Scupoli. He also wrote letters of spiritual direction extensively and there is a collection of some of these in a book called, "Letters of Spiritual Direction". Half of this book are letters of spiritual direction written by him to others and the other half are letters of spiritual direction written by St Jane De Chantal. This book is one in a series called, "The Classics of Western Spirituality", and can be purchased by itself. Another very excellent book is "Secrets of the Interior Life" by Luis M Martinez, Archbishop of Mexico. If unable to find a good spiritual director, God will often lead souls by way of holy books of direction by the saints themselves and are an excellent way to be guided. The books I listed are excellent for people living in this modern age and who desire to lead a more holy life. Thank you Father for an excellent article. I'm a lay Carmelite, the ancient order, but we are studying St. Teresa of Avila. We had an excellent spiritual director, but he was moved about 100 miles to the center of the diocese. St. Teresa is a great guide, and I also recommend Fr. Scupoli's book, Spiritual Combat. But I must say I would like to find a good Father Director. Let us pray at this time of Easter that we all get excellent spiritual directors, because certainly Our Lord wants us to have one. A humorous thought: what would happen to the poor priests if all of the parishioners who have made their first Penance wanted to go to monthly confession and get a little spiritual direction at the same time, and took 15 minutes each? How many hours would YOUR Pastor be in the confessional? That's about what our Holy Father has said is the baseline for a parish! If only 1000 in our parish did this, the Pastor would be in the confessional about 60 hours a week. God bless you. 1) Priests ordinarily go to seminary school for 8 years (or at least 4 years). The formation is academic (intellectual), spiritual, pastoral, and also human. This formation is almost continuous (literally, nearly 24 hours a day 7 days a week) for the whole 8 years. And, even after all that training, very few priests are truly capable confessors or directors. Does anybody really think that a 3-4 year program (which is not even live-in) suffices for lay people? 2) After this intense 8 year seminary formation, newly ordained priests work with a more experienced priest for usually at least 2 years. Again, this is a 24/7 formation, as they live with the priest and receive constant guidance. 3) The priest's whole life is dedicated to his people (or at least it ought to be) -- he has no family, no other work, no other obligations. But all he does is for the flock. Even with that, many priests still find it difficult to dedicate the time needed for direction (since prayer for the people outside of actual meeting time is very important). How can we expect lay people, who have jobs and (perhaps) families, to be truly dedicated and serve as directors of souls? For my part ... I can hardly think of a single situation in which I would recommend a lay person to go to another lay person for formal spiritual direction. Nuns and monks serving as directors is, of course, a different story all together. Though, personally, I would consider the case of permanent deacons to be pretty much the same as that with lay directors -- rarely would a permanent deacon be capable of serving as a director. I would never go to a lay person for spiritual direction. They do not have the grace of state to do such a thing, in my opinion. It would be the blind leading the blind. I recently finished a wonderful book on this topic: SEEKING SPIRITUAL DIRECTION, HOW TO GROW THE DIVINE LIFE WITHIN BY FR THOMAS DUBAY, S. M.--A guide for Christians who are considering spiritual direction. It's focus is on the qualities to look for in a director, how to find one in this day and age, and ways to develop a deeper prayer life.